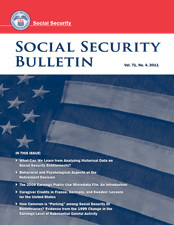 This article introduces the 2006 Earnings Public-Use File (EPUF), a data file containing earnings records for individuals drawn from a 1-percent sample of all Social Security numbers issued before January 2007. The EPUF contains selected demographic and earnings information for 4.3 million individuals. It provides aggregate earnings data for 1937 to 1950 and annual earnings data for 1951 to 2006.